Irbid (Arabic: إربد‎), kent in auncient times as Arabella or Arbela , is the caipital an lairgest ceety o the Irbid Govrenorate. 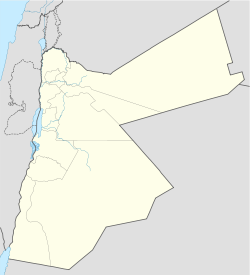 It an aa haes the seicont lairgest metropolitan population in Jordan efter Amman, wi a population o aroond 660,000, an is locatit aboot 70 km north o Amman on the northren ridge o the Gilead, equidistant frae Pella, Beit Ras (Capitolias), an Umm Qais. The ceety o Irbid is the third lairgest ceety in Jordan bi population (efter Amman an Zarqa). Metropolitan Irbid is the seicont lairgest. The province o Irbid Govrenorate haes the seicont lairgest population, an the heichest population density in the kinrick. The ceety is a major grund transportation hub atween Amman, Sirie tae the north, an Mafraq tae the east. The Irbid region is an' a' hame tae several colleges an universities, the twa maist prominent being Jordan University of Science and Technology an Yarmouk University. Airtifacts an graves in the aurie show that Irbid haes been inhabitit syne the Bronze Age. Pieces o pottery an waw stanes foond at Tell Irbid wur estimatit tae be made in the year 3200 B.C. In the Hellenistic period, Irbid, then kent as Arabella wis a major trade center an the birthplace o Nittai o Arbela. Afore the advent o Islam, the ceety wis kent as Arabella an wis famous for producin some o the best wines in the auncient warld. The aurie in the region haed extremely fertile soil an moderate climate, allouin the growin o heich quality grapes. Efter the Muslim conquests, it came unner the rule o the Muslim Empire, the ceety became kent as Irbid, an shiftit frae wine tae olive oil production. Wheat wis an aa an important product in the aurie. Irbid is notable for being close tae the site o the decisive Battle o Yarmouk, fought alang the banks o the Yarmouk River roughly 30 kilometres north o the ceety. The battle wis waged atween the Islamic Caliphate led bi Umar an the Byzantine Empire. It set the stage for the depairture o Byzantine airmies frae Greater Sirie an the beginnin o the expansion o the Islamic Caliphate. Irbid the day combines the bustle o a provincial Middle Eastren toun an the youthful nichtlife o a typical college toun. University Street, which defines the wastren border o the Yarmouk University campus, is popular wi locals as well as wi the occasional foreign visitors who stop tae relax in ony o its numerous restaurants an cafés. Though no uisually a major tourist destination itsel, Irbid is hame tae twa notable museums: the Museum o Jordanian Heritage an the Jordan Natural History Museum, baith on the campus o Yarmouk University. Furthermair, Irbid's strategic location in northren Jordan makes it a convenient stairtin point for tourists interestit in seein the northren Jordan Valley; visitin Umm Qais, Beit Ras (Capitolias), Pella, Ajloun, Umm el-Jimal, an ither historical steids; or travelin on tae Sirie. Ceeties, Touns, an Veelages Mony veelages surroond the ceety o Irbid includit: Al-Taybeh (الطيبة), Habaka (حبكا‎),Kufr-Rahta( كفررحتا ), Al-Mazar Al-Shamali (المزار الشمالي), Bushra or Bishra (بشرى ), Hareema (حريما), Alal( علعال ), Kufrasad,kufr_Asad (كفرأسد) Al Omari family.North o Irbid , Kufraan (كفرعان), Jumha, Kufryuba, Zahar, Qum, Sammou', Izmal, Kufrelma, Sawm, Saydoor, kufersoom, Sama al-Rousan (سما الروسان), Ibser Abu Ali, Assarieh, Aidoon, Al Hisn, Baleela, Kitim, Beit Ras(بيت راس), Dowgarah, En-Nu`aymeh, Habaka, Houfa Al-Westiyyah, Qumaim, Huwwarah, Imrawah, Ramtha, Sal, Samad, Shajara, Turrah, hatim, melka, foauta , Zoubia, Rehaba, Kharja, Dair yousef, Dair abos'eed, Dair yosef, kufor kefia, summer, e'nbeh, Bayt Yafa (بيت يافا) Dair Esse'neh (دير السعنة), Mandah, Marw قرية مرو الصامدة Zabda, as well as the toun o Malka (ملكا), Bait Idis (بيت ايدس). Maist o the ceety's economy is based on the services sector, that is directly or indirectly relatit tae the heicher education institutions in the ceety, as an example there are 26 beuk publishin companies in the ceety. The number o internet cafes per caipita is the heichest in the warld that teuk Irbid tae the Guinness Book of World Records. Irbid is considered the cultural caipital o Jordan. The Irbid-based club Al Hussein Irbid wis ranked fowert in the Jordanian fitbaa Premier League in 2008. Its hame matches are held in Prince Hasan Youth City's stadium. The ither major fitbaa club in Irbid is Al-Arabi. Established in 1945, it is ane o the auldest athletic clubs in the kintra. There are 22 cultural an sport clubs registered in Irbid. Irbid hostit the 1999 Pan Arab Gemmes. Wikimedia Commons haes media relatit tae Irbid.